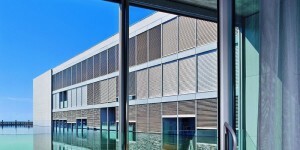 The Metalunic external venetian blind is often encountered in everyday practice. It can be tilted not only manually but also automatically in every height setting. The safety locking device makes things difficult for intruders. 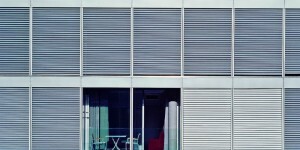 All-metal construction with self-supporting slats. Lifting and adjustment mechanism integrated in the lateral guides. Lateral lifting mechanism with roller chain made of steel. Stainless scissor chain for slat position in every blind position. Lowering position in 2 variants, raising the blinds in brightness position tilted inwards. Good shading function. Safety locking device in every position. Safety sensing edge prevents the destruction of the blind when running up against obstacles. 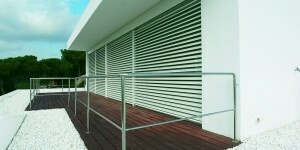 Slats bordered on both sides with rolled-in, noise-insulating sealing lip. Baked enamel finish in 150 Premium Colors. Lateral guide rails (85x45 mm) for direct installation made of extruded aluminum, transparently anodized. With noise-insulating plastic glides on the pivot arms.